After an epic four year legal battle, the Australian High Court has upheld previous rulings that ISP iiNet is not responsible for the copyright infringements of its customers. Despite today's huge defeat for Hollywood, the chief of local anti-piracy group AFACT insists that the landscape has changed since the case began, with legislators and courts around the world now recognizing that ISPs have a role in preventing piracy. 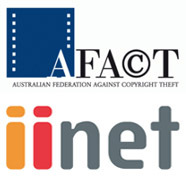 In what became known as the iiTrial, the marathon four-year legal battle that began in November 2008, a consortium of Hollywood Studios with token Australian representation going under the banner of the Australian Federation Against Copyright Theft (AFACT) took iiNet to court. The case navigated several layers of the Australian court system, with iiNet winning the initial ruling and all subsequent appeals, before finally ending up in front the High Court in December last year. The thrust of the case hung on whether iiNet had willingly authorized the copyright infringements of its customers. Lower courts found that iiNet had no duty to police its own networks, even when AFACT supplied so-called proof of infringement by its customers. Just moments ago, the High Court unanimously dismissed AFACT’s final appeal. “The Court observed that iiNet had no direct technical power to prevent its customers from using the BitTorrent system to infringe copyright,” a summary of the Court’s findings read. Since the notices were inadequate, iiNet could not be considered to have authorized the infringements of its subscribers when it did not act on them. The High Court sits at the pinnacle of Australia’s legal system and its rulings cannot be appealed. Today’s decision forms a binding legal precedent on all lower Australian courts and will be taken into consideration by judges in countries with comparable legal systems such as India, Canada and the UK. AFACT could never have known Wikileaks would out the plot, or that the legal case would so spectacularly backfire. Today’s decision will hurt Hollywood’s copyright enforcement agenda on multiple levels. Alongside the setting of an unwanted legal precedent, AFACT has been dealt a significant public relations blow in its ongoing lobbying efforts in Australia. Anticipating a loss in the case, AFACT began lobbying government and ISPs behind closed doors last December. The process has been widely criticised for a lack of public consultation. While the Australian government has suggested it prefers an industry agreed model for combating copyright infringement to legislation, leaks have revealed AFACT and its lobbying partners have been pressuring for an outcome that forces ISPs into a policing role. The option of having ISPs forced into that role through the courts has been blunted by today’s High Court decision and it can be expected AFACT will step up their lobbying efforts of law-makers directly. Update: Both parties held separate conferences following the emphatic 5-0 High Court decision. The mood in the iiNet camp, who stand to recoup $6 million in legal fees, was jubilant. AFACT’s Neil Gane was expectedly downbeat. “Both judgements in this case recognize that copyright law is no longer equipped to deal with the rate of technological change we have seen since the law of authorization was last tested,” he said. iiNet CEO Michael Malone was keen to stress the importance of the win. “This is a world first case. No case has gone to judgement in the highest court in the land. I’ve had text messages and emails from people from all over the world,” he said. Mr Malone said he looked forward to finding solutions to content piracy, but said a large part of the problem was content creators’ unwillingness to make their products available in a timely and cost-efficient manner. Expressing a personal fondness for hit US TV series Game of Thrones, Mr Malone lamented he was not able to access the latest episodes of the show legally in Australia. Both Mr Malone and Mr Dalby expressed concerns about AFACT’s methods for collecting data on alleged infringers. “I dont’ have any confidence in the notices [of alleged infringement] that we’ve seen,” Mr Dalby said. Mr Malone added that by standing up to AFACT and its Hollywood backers iiNet had enhanced its reputation in the Australian marketplace. “I’d argue [the court case has] positively impacted our reputation … Our role is to connect customers to the internet and with each other. We’re not going to remove your access without some sort of independent review,” he said. c There are 69 comments. Add yours?